FILE - This image provided by Russian Defense Ministry Press Service and released June 23, 2017, shows a target in Syria hit by a missile launched by a Russian navy ship in the eastern Mediterranean. Russia's Defense Ministry said it fired cruise missiles from the Mediterranean Sea on positions of the Islamic State in Syria. Even as tensions between the United States and Russia fester, there is one surprising place where their military-to-military contacts are quietly weathering the storm: Syria. It has been four months since U.S. President Donald Trump ordered cruise missile strikes against a Syrian airfield after an alleged chemical weapons attack. In June, the U.S. military shot down a Syrian fighter aircraft, the first U.S. downing of a manned jet since 1999, and also shot down two Iranian-made drones that threatened U.S.-led coalition forces. All the while, U.S. and Russian military officials have been regularly communicating, U.S. officials told Reuters. Some of the contacts are helping draw a line on the map that separates U.S.- and Russian-backed forces waging parallel campaigns on Syria's shrinking battlefields. There is also a telephone hotline linking the former Cold War foes' air operations centers. U.S. officials told Reuters that there now are about 10 to 12 calls a day on the hotline, helping keep U.S. and Russian warplanes apart as they support different fighters on the ground. That is no small task, given the complexities of Syria's civil war. Moscow backs the Syrian government, which also is aided by Iran and Lebanon's Hezbollah as it claws back territory from Syrian rebels and Islamic State fighters. Colonel General Sergei Surovikin, commander of the Russian forces in Syria, left, and Colonel General Sergei Rudskoi of the Russian General Staff attend a briefing in the Russian Defense Ministry in Moscow, June 9, 2017. 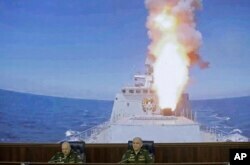 A screen in the back shows a Russian navy's Admiral Essen frigate launching a cruise missile at the Islamic State in Syria. The U.S. military is backing a collection of Kurdish and Arab forces focusing their firepower against Islamic State, part of a strategy to collapse the group's self-declared "caliphate" in Syria and Iraq. Reuters was given rare access to the U.S. Air Force's hotline station, inside the Qatar-based Combined Air Operations Area, last week, including meeting two Russian linguists, both native speakers, who serve as the U.S. interface for conversations with Russian commanders. While the conversations are not easy, contacts between the two sides have remained resilient, senior U.S. commanders said. "The reality is we've worked through some very hard problems and, in general, we have found a way to maintain the deconfliction line [that separates U.S. and Russian areas of operation] and found a way to continue our mission," Lieutenant General Jeffrey Harrigian, the top U.S. Air Force commander in the Middle East, said in an interview. As both sides scramble to capture what is left of Islamic State's caliphate, the risk of accidental contacts is growing. "We have to negotiate, and sometimes the phone calls are tense. Because for us, this is about protecting ourselves, our coalition partners and destroying the enemy," Harrigian said, without commenting on the volume of calls. The risks of miscalculation came into full view in June, when the United States shot down a Syrian Su-22 jet that was preparing to fire on U.S.-backed forces on the ground. U.S. officials, speaking on condition of anonymity, said those were not the only aircraft in the area. As the incident unfolded, two Russian fighter jets looked on from above and a American F-22 stealth aircraft kept watch from an even higher altitude, they told Reuters. 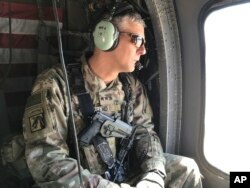 FILE - U.S. Army Lt. Gen. Stephen Townsend surveys positions during a tour north of Baghdad, Iraq, Feb. 8, 2017. After the incident, Moscow publicly warned it would consider any planes flying west of the Euphrates River to be targets. But the U.S. military kept flying in the area, and kept talking with Russia. "The Russians have been nothing but professional, cordial and disciplined," Army Lieutenant General Stephen Townsend, the Iraq-based commander of the U.S.-led coalition, told Reuters. In Syria, U.S.-backed forces are now consumed with the battle to capture Islamic State's former capital of Raqqa. More than half the city has been retaken from Islamic State. Officials said talks were underway to extend a demarcation line that has been separating U.S.- and Russian-backed fighters on the ground as fighting pushes toward Islamic State's last major Syrian stronghold, the Deir ez-Zor region. The line runs in an irregular arc from a point southwest of Tabqa east to a point on the Euphrates River and then down along the Euphrates River in the direction of Deir ez-Zor, they said. U.S. Defense Secretary Jim Mattis, during a visit to Jordan this week, said the line was important as U.S.- and Russian-backed forces come in closer proximity of each other. "We do not do that [communication] with the [Syrian] regime. It is with the Russians, is who we're dealing with," Mattis said. "We continue those procedures right on down the Euphrates River Valley." Bisected by the Euphrates River, Deir ez-Zor and its oil resources are critical to the Syrian state. The province is largely in the hands of Islamic State, but has become a priority for pro-Syrian forces. It also is in the cross hairs of the U.S.-backed Syrian Democratic Forces (SDF). SDF spokesman Talal Silo told Reuters last week that there would be an SDF campaign toward Deir ez-Zor "in the near future," though the SDF was still deciding whether it would be delayed until Raqqa was fully taken from Islamic State.